You’ve worked hard to land an internship, but your efforts shouldn’t stop once you receive that long-awaited offer! 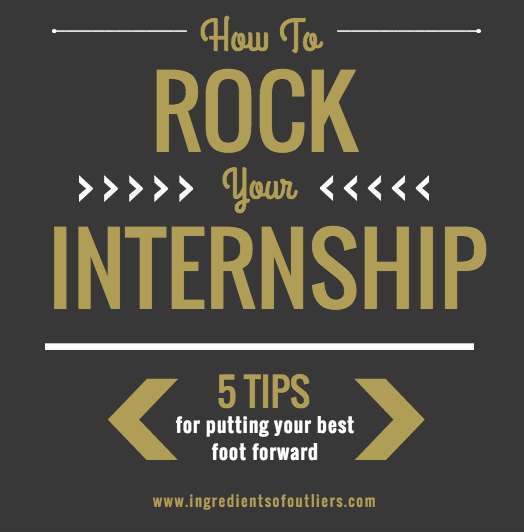 An internship is like a long-term interview between you and your employer. It’s an opportunity for you to get to know the company, learn the business, and showcase your talent! If navigated correctly, an internship will provide you with either a job offer at the end of it, or provide valuable leads that will open doors for future career opportunities. We’ve gathered a few tips from Career Contessa and Bonjour Blue to help you put your best foot forward as you enter your new job. Do your homework. You’ll be spending a significant amount of time with this company, so make sure you stay current with company updates and industry news throughout your time as an intern. This will boost your level of investment, which will not only make you more connected to your job, but will also shine through as you interact with your managers and coworkers. Keep a positive attitude. Your attitude speaks volumes to who you are as an individual. Stay humble, graciously accept criticism, and take on new tasks with a go-getter approach. Your employer is evaluating how you handle small tasks to see if they can entrust you with bigger projects. Most likely they have more work they would gladly hand you; they simply need to learn if they can trust you. If you are easily weighed down or even appear to be “above” an everyday task, they will question whether you can last long-term with more responsibility. An eager attitude proves to them you are adaptable, can roll with the punches in any situation, and have the right leadership qualities for the job requirements in or above your position. Make the most of your time. Let them know by the way you manage your time that you are excited to be there and want to make the most of this opportunity. Arrive early, leave late, and see your projects through to completion. Prove your work ethic by staying fully engaged throughout the entirety of the day, even when it’s tempting to cut corners or check out. (We dive further into making the most out of every experience here). It’s all in the way you say it. The manager or boss should appreciate your keen eye if you say it respectfully and helpfully. Roll with the punches. You will likely find yourself working on a project that is unclear, or find yourself having to scrap your work if your team changes direction. Try your best to figure things out on your own and don’t lose confidence when you’re required to work outside your comfort zone. Sometimes, your employer is looking for you to be able to creatively solve a real problem and have the ability to make an “executive” level decision. The more adaptable and flexible you are, the more effective you’ll be! Remember, you were chosen for this position because somebody believes you have what it takes. Walk into your first day knowing what kind of intern you want to be and be prepared to give it your all. With these tips in the back of your mind, you will surely be outstanding! What “ingredients” do you think make up a successful intern? Share with us below!